I happened upon this creature by chance during my search for a creature of interest, the Dullahan. It comes from Irish folklore and is essentially a Fairy Being from the UnSeelie Court (Chaos or Malevolence). It is headless, with features and skin color of mouldy cheese, self illuminating, and has little eyes that dart like flies and a psychotic grin from ear to ear. He also rides a headless horse (!) and wields a whip made from a human spine. He is a herald of Death and only possesses the power of speech when he calls out the name of the person meant to die. Upon doing so , said person dies on the spot as the Dullahan calls the soul to come to him. If you are unlucky enough to see the Dullahan riding, he will throw a basin of blood at you, marking you the next person to die, or whips out your eye(s). He often pairs up with the Banshee (another creature that befalls death with her wail) to ride a black carriage made of mortuary items called the coach-a-bower. The Dullahan is not really evil, just following the natural order and doesn't pick targets as it comes for the person who is about to die, even at the spot of their death, so it has no natural weaknesses, save for a fear of gold. If you notice any similarities to another famous headless rider, then you are not far from the truth, the Dullahan may have been the basis for the Headless Horseman from Sleepy Hollow or the Green Knight from Sir Gawain and the Green Knight. 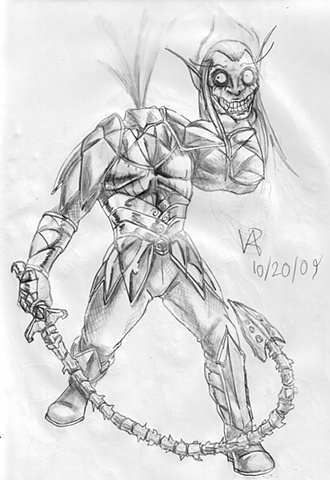 For my interpretation of the Dullahan, I used a drawing of Elvish armor I had in my morgue files and photo referenced a spine for the whip, then I went and tried to do my best psychotic grinning head, adding little textures to clothing and armor, while closing the drawing up with a fountain of blood spurting out of its neck.